Kolkata, March 20: Despite losing the home ODI series 2-3 to Australia, the Virat Kohli-led Team India is considered the favourites for the upcoming World Cup. 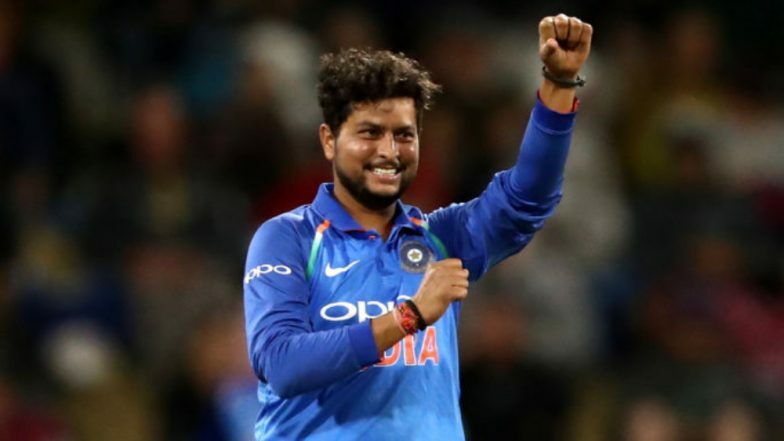 However, chinaman bowler Kuldeep Yadav believes two other teams also have the capability to shine in the showpiece event, starting May 30 in England and Wales. Kuldeep has said that India have a chance to clinch the trophy but should be aware of England and Pakistan as the two teams which also have some quality players in their side. The spinner also felt that playing in home conditions will be an advantage for England. "We definitely have the chance to bring the World Cup home. Apart from us I think all the other teams are really strong," Kuldeep was quoted as saying by Sports Tak. MS Dhoni Helps Kuldeep Yadav to Dismiss Trent Boult During Ind vs NZ 1st ODI 2019; Heard Saying, ‘Ankh Band Karke Rokega’ On Stump Mic (Watch Video). "But I feel England has a strong batting lineup as compared to the other teams. They will be playing in home conditions. I think Pakistan will also perform well in the World Cup looking at the way they have been performing," the 24-year-old opined. "So I think England and Pakistan will be the ones to watch out for," he added. Captain MS Dhoni Threatens Kuldeep Yadav; Says, ‘Bowler Change Karein?’ During Asia Cup 2018 Match Against Afghanistan (Watch Video). Playing in their last ODI series before the World Cup 2019, India recently suffered a shocking loss to Australia at home. Looking at their recent ODI performances, however, cricket pundits still believe the Men in Blue will be the title favourites.